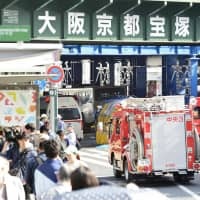 Grand champion sumo wrestler Harumafuji was involved in a drunken brawl late last month that left fellow Mongolian competitor Takanoiwa hospitalized with serious injuries, his stablemaster admitted to sumo administrators on Tuesday. Stablemaster Isegahama’s comments were the first public acknowledgment of the incident. 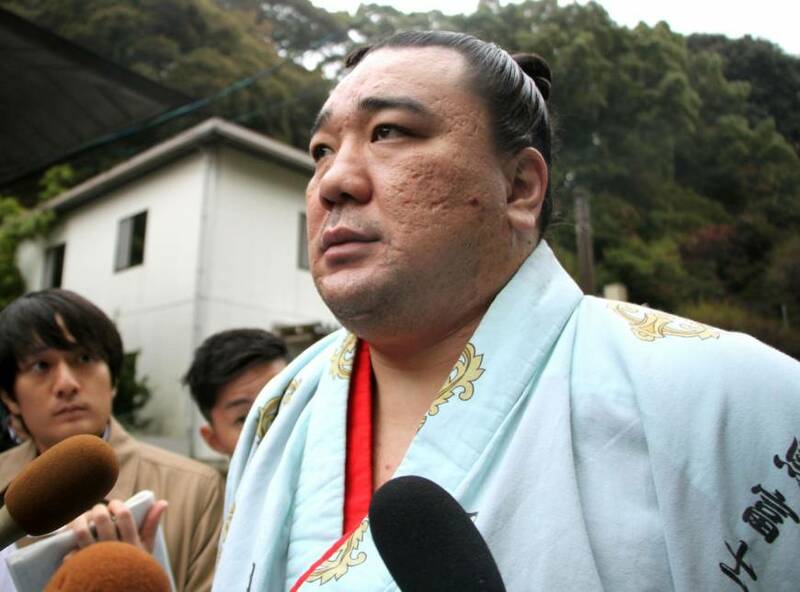 According to a report in the tabloid Sponichi, Harumafuji was drinking with other Mongolian wrestlers on Oct. 26 after a regional tour in Tottori when the yokozuna, angered by Takanoiwa’s attitude, struck him with a beer bottle. 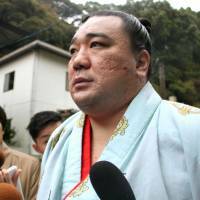 On Tuesday morning, Harumafuji, a nine-time tournament winner, was reluctant to address the report but later submitted paperwork to pull out of the ongoing Kyushu Grand Sumo Tournament, ending his current bid for a 10th career title. 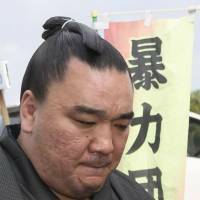 The Japan Sumo Association announced Monday that eighth-ranked maegashira Takanoiwa has been diagnosed with a concussion and a fractured skull, among other injuries, and revealed that he had been hospitalized from Nov. 5 to 9. On Tuesday morning, JSA executives including chairman Hakkaku gathered at the Fukuoka Kokusai Center to confront Harumafuji and the two stablemasters. 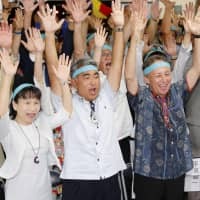 The governing body said a crisis management team will investigate the case but will not hand down its ruling or punishment during the Kyushu tournament. Meanwhile, Takanoiwa’s stablemaster Takanohana said he had earlier filed a police report in Tottori. Takanoiwa, 27, was one of the early withdrawals from the Nov. 12-26 tournament. He is expected to miss the entire meet and be demoted to the lower juryo rank at the meet in January. Both wrestlers are in sumo’s top makuuchi division. Since his debut at the New Year tournament in 2001, Harumafuji, 33, has won the championship nine times, his last title coming at the autumn meet in September when he competed as the only yokozuna while the other three withdrew due to injury. In September 2012, Haramafuji earned a promotion to yokozuna, becoming the third consecutive Mongolian-born wrestler after Asashoryu and Hakuho to achieve the top rank. 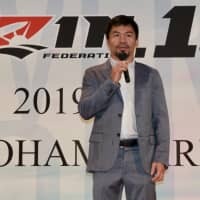 Despite his bid for a second title this year, he lost his first two bouts in Fukuoka and will forfeit his scheduled third-day bout against top-ranked maegashira Tamawashi. ﻿﻿ His withdrawal from the meet is the eighth in his career. 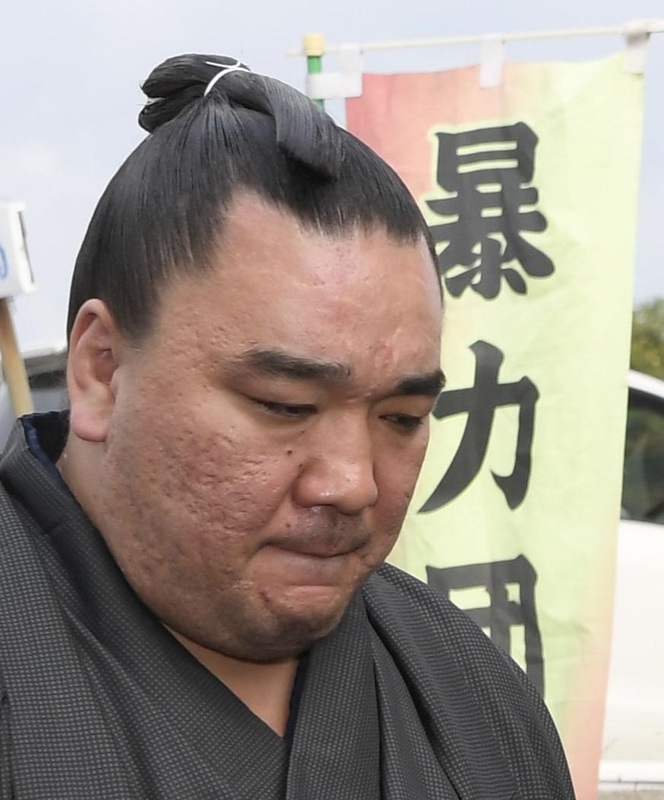 Yokozuna Kakuryu withdrew earlier due to injury, leaving only two grand champions — Kisenosato and Hakuho — with 13 days remaining in the sellout tournament. “He put on a strong performance to prove his worth as yokozuna in the last basho, so it’s disappointing that he has to pull out this way. It throws a wet blanket on an exciting tournament,” said former NHK announcer Kunihiro Sugiyama. The incident has sent shock waves across the country, reminding fans that the ancient sport has yet to improve its reputation tainted by scandals over match-fixing, violence and bullying. In 2010, Mongolian yokozuna Asashoryu retired from the sport following allegations that he attacked a man outside a Tokyo nightclub in the middle of the New Year tournament, though he did not directly comment on the drunken brawl. 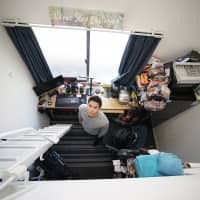 In June 2007, the police arrested stablemaster Tokitsukaze and three wrestlers who beat 17-year-old Tokitaizan to death using a beer bottle, a wooden stick and a metal bat. The junior wrestler, whose real name was Takashi Saito, died from shock due to trauma.